One week out from Gallifrey One, it’s time to take stock of what we saw at the family reunion. We bid farewell to an iconic carpet and take one last look at a convention every Doctor Who fan should experience at least once. We catch up with Jody Houser and Rachael Stott for more about their Thirteenth Doctor comic, and then we wrap things up with an important announcement. There’s no better guide to the worlds of Big Finish productions of Doctor Who and other great properties than a former skeptic about audio drama. We welcome Radio Free Skaro’s Warren Frey as we take a criminally overdue deep dive into Doctor Who for the ears instead of the eyes. Shannon Dohar, friend of TWiTT, co-host of the Deeper Cuts album review podcast, and frequent Reality Bomb contributor, flexes her musical muscles and discusses with us Segun Akinola’s music from Episode 1 to the New Year’s Special. What makes him the right composer for today’s Doctor Who, and how hard was it to make the transition from 10 seasons of Murray Gold? Regenerations can be challenging—but this new soundscape is worthy of celebration…. A bite-sized episode revisits academic fandom with a look at the dedicated programming track at this year’s Gallifrey One convention. Organizers Joy Piedmont and Paul Booth take us through what it means to look at Doctor Who through a scholarly lens. That’s a wrap for 2018, This Week in Time Travel, and Series 11! Rachel Donner and Riley Silverman join us to sort out the brilliant and the tragic, the groundbreaking and the played-too-safe. Find out where we stand and what we’re looking forward to in Series 12, and tune in again when we return for the New Year’s special! One froggy universe, two grieving husbands, one mystery woodland menace, a kajillion moths, and one question from Alyssa: who’s allowed to be selfish in grief? Zombies? Check. Sci-fi prison? Check. Historical figure? Check. Prestige casting? Check. Commentary on the human condition, drawing analogies to our current crisis of confidence in ourselves and our tendency to blame and persecute the other in response? Check. Houdini reference? Check. “The Witchfinders” tried to cover all the bases. Let’s see if it succeeded. Happy Thanksgiving! Alyssa and Chip had some extra time to consider “Kerblam!”—whether it didn’t have enough of a point of view or too many, whether the first 40 minutes made up for the last few, and whether it might have gone over better in the U.S. if Amazon hadn’t been especially juggernauty in the last few weeks. Thanks to travel schedules and Alyssa’s exhaustion after helping to Save Democracy As We Know It, we had a few extra days to consider “Demons of the Punjab”: whether it got the balance of SF and family drama right, how it treated history compared to “Rosa,” and how (and whether) our grandparents’ stories get told. It’s eight-legs vs. two-legs again, but unlike 1974’s Planet of the Spiders these arachno-invaders are simply the very confused coincidental by-product of a business empire led by someone who’s TOTALLY NOT TRUMP. NO SIR. Alyssa and Chip discuss whether (1) the plot holds up, (2) Yaz plays on Alyssa’s team, (3) Grace’s appearance opens wounds for Graham AND viewers, and (4) we know now just who the Doctor is. This was the episode that we held our breath for. Could British writers do justice to the woman who inspired the Montgomery bus boycotts, and fairly reflect the movement for civil rights? Spoiler alert: we think the answer is a resounding yes. We delve into why this historical story reminiscent of early ’60s Doctor Who spoke so clearly to us, and was very much the kind of Doctor Who story we all needed on Oct. 21, 2018. In addition to the world’s fastest news buffet, we journey to the Planet of Desolation in search of the Doctor’s ride. Has Jodie Whittaker fully inhabited the role? Are Yaz, Graham and Ryan gelling as a TARDIS team? Can you do a sight gag in a podcast? It’s the eve of new Doctor Who and we couldn’t be more ready. Titan Comics is celebrating with a virtual giveaway of $300 worth of comics, including Paul Cornell’s last (he means it this time) work on Doctor Who. We talk to Paul, go over the news of the week, and compare notes on what it’s like to leave and return to Doctor Who fandom. It wasn’t a new idea, but it took a long time for the powers that be to take it seriously. Alyssa traverses the twists and turns that brought the notion of a female Doctor to reality. Chip reflects on the best thing about being a Doctor Who fan, and the best TIME to be one. Plus the news, in the penultimate week before Jodie Whittaker takes the stage. Comedian and writer Riley Silverman joins Alyssa to celebrate, consider and critique the controversial River Song. Also, the Doctor Who PR juggernaut marches on while still managing to say VERY LITTLE before the premiere date! Will Thursday’s DWM break that trend? Chip demonstrates he’d be a rubbish time traveler because he can’t even manage simple time zones. Alyssa melts through the floor over Jodie Whittaker’s Marie Claire UK photoshoot. And there’s plenty of actual news to talk about, including that premiere date announcement video that doesn’t just break a glass ceiling, but also breaks new ground. We return from our unexpected hiatus in time travel bringing you Rachel Talalay, who joins Alyssa to celebrate the late Michael Pickwoad. Also, we launch a new segment about those episodes that we both enjoy and cringe at, simultaneously. Reality Bomb’s Joy Piedmont and Verity!’s Deb Stanish are here to help us define Problematic Faves. Alyssa and Chip retreat to the memory palace and enjoy the highlights of the new Doctor Who era’s and Jodie Whittaker’s debuts in San Diego. Over the last half a century, the most consistent thing about Doctor Who has been the least consistent thing: the character of the Doctor. Regeneration after regeneration, is the Doctor reinvented top to bottom, or is there still something that we can point to, at any time from 1963 to today, and say, “That’s who the Doctor is”? Rachel Donner returns for the news and a dive into the psyche of a Time Lord. OK, we know that fan art is a visual medium. And podcasts are…not. But we’ve brought along some fan artists who’ve made a real impact. Nathan Skreslet and Ly Cao from Pixel Who are here to talk about the fan artist community in Doctor Who, what it’s like to reinterpret the show, and what it takes to make a business of it. Your two fried cohosts take a quick tour through the news of the week and bring you an in-depth conversation about what “canon” in Doctor Who really means with rabid fan and New Testament scholar Mark Goodacre, in an archive recording from Chip’s Two-minute Time Lord Podcast, episode 316. For every character, for every dramatic plotline, for every ship: there’s a fanvid. Kim and Sage of Head Over Feels return to This Week in Time Travel to talk about their expertly curated collections of fan-edited videos guaranteed to make you swoon or swear. Plus: Erika and Liz from Verity! stop by with a report from Twitch’s first week of streaming classic Doctor Who episodes, and Chip and Alyssa have strong feelings about Radio Free Skaro’s scoop that some missing episodes may be in the hands of private collectors. It’s a short, live-and-in-person walk through the news of the week including a new venue for classic Doctor Who, a new book series about Doctor Who book series, your chance to welcome Jodie Whittaker, and another fan convention setting the wrong example. Some fans are content to consume stories. Others want to expand on them, or even transform them. Part two of our Fandom Perspectives series is about fanfiction, a creative outlet that may even have contributed to the return of Doctor Who. Paul Cornell joins us to talk about fanfic’s role in the wilderness years, and Shannon Sudderth and Alyssa compare notes on fanfic in the RTD years and today. At its best, fandom culture is all about participation! We begin our Fandom Perspective series by looking at cosplay with friend and East Coast costumer Amanda-Rae Prescott. It’s a snack-size edition of This Week in Time Travel looking at Free Comic Book Day, the new Time Team, and the eternal question: can the Eric Roberts Master drezzzz for the occasion in audio? Our Doctor retrospective series concludes with, of course, the Twelfth Doctor. It’s a giant-size, Series 10-hair-size, celebration of everything he brought to the role courtesy of the Hugo-finalist Verity! podcast’s moderator, Deb Stanish! Alyssa promised that she would make Chip watch his very first reconstruction of a missing classic Doctor Who episode, as chosen by a random #WhoAgainstGuns donor. Thanks to David H. Adler, it’s time for “The Macra Terror” in living color…well, not color, but in living motion…well, not motion. Let’s go back to 2010 and welcome the worldwide goodwill ambassador from the BBC, the Eleventh Doctor, who ushered Doctor Who into even greater global popularity. Radio Free Skaro and Lazy Doctor Who’s Steven Schapansky joins us! He launched the show to new heights and became one of the most beloved Doctors of all of time and space—but he had his share of detractors! Shannon Sudderth helps us discuss David Tennant’s Doctor. Ninth Doctor, we hardly knew you! Rachel Donner rejoins the This Week in Time Travel team for a jam-packed episode celebrating Christopher Eccleston and his pivotal year in the role. The Eighth Doctor was truly the “Fans’ Doctor.” Not because fandom created him, but because thanks to novels and especially Big Finish, fans of Doctor Who got to know Paul McGann’s Doctor while the wider world missed out. Alyssa and Chip talk about his arc from the TV movie to “Night of the Doctor” while preparing for their live show at (Re)Generation Who with Rachel Talalay on Saturday, March 24! The master of the Hat Trick, Sylvester McCoy’s Seventh Doctor, falls under the watchful eye of returning guest Kathleen Schowalter. There’s a bumper crop of news, too, including the outcome of the main #WhoAgainstGuns campaign push, Series 11 casting, and more! Our fearless leader Jason Snell joins us to discuss the brightest and brashest of the Doctors: Colin Baker’s Sixth Doctor. Plus, we have an update on #WhoAgainstGuns, some details and controversy over Series 11, and a look ahead to our live show at Regeneration Who! It’s an interview spectacular! Writers Rona Munro and Jenny Colgan, costume designer Hayley Nebauer, and stop-motion puppeteer Alisa Stern (“Doctor Puppet”) all talked with us at Gallifrey One. PLUS: Alyssa and Chip review the new Doctor Who branding with considerable glee, and discuss the shocking surprise news of Target-style novelizations of new-series episodes. We never saw that coming. 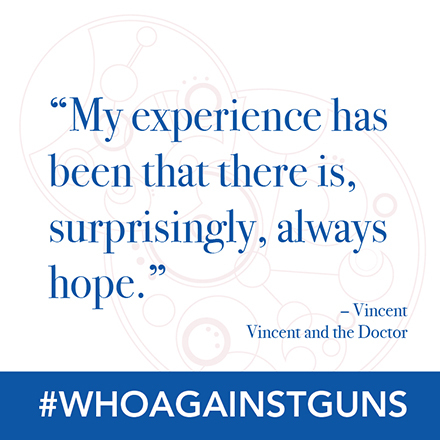 Support #whoagainstguns and get access to an epic commentary podcast featuring many of your favorite Doctor Who podcasters and special guests. Find out more at realitybombpodcast.com/whoagainstguns. Women’s voices rang powerfully and true at the end of the 29th Gallifrey One convention. Alyssa looks back on a profound #MeToo moment as Doctor Who actors, writers and other creators talked about their struggles within the entertainment industry. We take some time to honor their testimony while also celebrating the other highlights of a very successful con weekend. There was also a lot of news from the comics, visual effects, and Riverdale (???) fronts! Graeme Burk rejoins us to rhapsodize about the beige-est of Doctors, the Fifth! Plus, loads of news and “news” as Chip and Alyssa prepare for convention season. None more iconic: Tom Baker strode across Doctor Who as a giant for seven years, and we have comedian Riley Silverman here to celebrate him. It’s time to reverse the polarity and introduce the Brig to the concept of Women’s Liberation. Bring back the opera capes and the short short skirts! It’s time to talk about the Third Doctor. We’re joined by author, editor and zombie mathematician Robert Smith? as we discuss the Second Doctor’s place in the canon. Plus: Peter Capaldi’s surprise post-tenure appearance at an upcoming East Coast con, (Re)Generation Who 4! January 23, 2018 • 39 minutes • Analyzing the Second Doctor • Chip Sudderth and Alyssa Franke with Robert Smith? Doctor Who: The Writers’ Room co-host Erik Stadnik was the perfect guest this week. Not only does he adore the First Doctor, making him a great pick to kick off our weekly survey of the Doctors, but he was also on hand to review the career of Fourth Doctor scripter David Fisher who passed away this month. New year, new Doctor, new themes for the year ahead for This Week in Time Travel! This week’s Doctor Who Magazine sets the tone with its official “Jodie Whittaker is The Doctor” cover. We squee about that, dissect the ratings of Twice Upon a Time, and go over our 2018 Masterplan as we head toward Whittaker’s fall debut. It’s almost the beginning of the Jodie Whittaker era, and the moment has been prepared for. Alyssa and Chip talk about how the Capaldi Finale also sets the stage for Whittaker and Chris Chibnall to relaunch Doctor Who. It’s a splendid final performance for Capaldi, but how did the rest of it hold together…? Before “World Enough and Time” and “The Doctor Falls”—WAY before—there was “The Tenth Planet.” We take a look all the way back at the introduction of the Cybermen and the First Doctor’s regeneration in anticipation of some connections to next week’s Christmas special. Everything ends, and it’s always sad. But everything begins again too, and that’s always happy. Chip, Alyssa and Rachel are joined by Joy Piedmont as our Christmas Masterplan draws to a close with “The Husbands of River Song” and “The Return of Doctor Mysterio.” Plus, in the news, Alyssa takes some time to reflect on a recent Radio Times interview with Steven Moffat about whether Doctor Who could have moved faster in bringing a woman to the role. Warren Frey from Radio Free Skaro helps us resume our Christmas Masterplan as we look at Matt Smith’s swan song and Santa Claus vs. the Facehuggers. The Third Doctor may have had several friends and companions, but there was only one Jo Grant. And neither Three nor Jo would have ever made it onto our television screens if it wasn’t for the talents of Doctor Who’s first director. Alyssa Franke talks to actress Katy Manning and director Waris Hussein. Why Does Chip Hate Christmas (and Joy)? Alyssa has (supposedly) abandoned Chip. Just like Matt Smith in “The Doctor, The Widow, and The Wardrobe” and “The Snowmen,” Chip brings in some special help to fulfill the Christmas Masterplan: Deb Stanish, moderator of Verity! Plus, Toby Hadoke remembers groundbreaking classic director Paddy Russell. Don’t blink, don’t drink the water and — hey, who turned out the lights? We’re getting spooOOOoookky on this special Halloween edition of This Week in Time Travel, going over the episodes, monsters and tropes that chill and thrill us. Is four a crowd? Could Sunday night’s surprise announcement mean the return of a fully-fledged TARDIS team? Or is Chris Chibnall up to something more tricksy? Plus: the Christmas Masterplan marches on. It’s time to discuss The End of Time and A Christmas Carol with Reality Bomb’s Graeme Burk. It’s Christmas on the doomed Titanic, and somewhere in Victorian times, Cybermen are trying to crush our Christmas Cheer. We look back on our companion-less Christmas specials “Voyage of the Damned” and “The Next Doctor,” plus take a sneak peek into the past, present and future of…Shada! The Christmas Masterplan is underway! Join Chip, Rachel, and our guest Kathleen Schowalter as we begin a trek through all the Christmas specials through Peter Capaldi’s last episode. Say hello to the Tenth Doctor for the first time (sort of) and Donna Noble (also sort of)! Thirty years ago, Sylvester McCoy rolled out of a curly-haired wig to become the last Classic Doctor! We take advantage of the anniversary to talk about his strongest stories and his place in the Doctor Who firmament. Plus a preview of Reality Bomb’s upcoming podcast of their live show in New York and we talk about our Christmas Masterplan! We’re talking about the new Doctor Who Fluxx card game with Looney Labs co-founder Andrew Looney! Plus: your responses to last week’s “My Doctor Is…” question and a Dramatic Synopsis Reading! These three words mean arguments and strife! What makes The Doctor, well, The Doctor? Are there portrayals or characteristics that are just plain “unDoctorish”? How little will you be surprised by who Alyssa and Chip pick as “their” Doctors? What essential adjectives do they use when completing the phrase, “My Doctor is _”? And, finally, how do you complete the phrase? Share it with us on Twitter (@drwhothisweek) or Facebook with the hashtag #MyDoctorIs! Director Rachel Talalay has directed every Peter Capaldi-era series finale, and is in post-production on his swan song, Christmas’s “Twice Upon a Time.” We’re thrilled to talk to her about her experiences behind the camera, her work with Steven Moffat and Capaldi, her outreach to female fans and the state of the film and TV industries for women. Please join us! No matter how connected fans become online, there’s no substitute for gathering in person. We’re joined by con-runner Ken Deep of Long Island Who as we find out what it took to start a new Doctor Who convention. Chip and Alyssa also talk about the care and feeding of guests, cosplayers, panelists and other fans. He never said “Pop! Pop! Pop!” but Sydney Newman did transform British drama while creating Doctor Who along the way. We check in with Graeme Burk who annotated and supplemented Newman’s memoir, Head of Drama. Also, we celebrate Victor Pemberton’s memory and squee over Jodie Whittaker interviews and David Tennant casting news. What do you expect when you’re expecting a new showrunner? The whole This Week team has gone back over the Doctor Who and Torchwood episodes written by Chris Chibnall—everything from gaseous aliens and cyberwomen to dinosaurs on spaceships and mysterious cubes. Are there any clues to the future of Doctor Who when he takes over? Steven Warren Hill drops by to talk about his long-awaited opus about Doctor Who in America, Red, White and Who. Graeme Burk and Liz Myles take up the age-old question: were the candy-colored New Daleks in Series 5…rubbish? We say goodbye to Deborah Watling, and we look back at the Doctor Who panel at SDCC. It’s not every day history gets made with a casting announcement. Presenting the 13th Doctor: Jodie Whittaker. Christel Dee is the host of Doctor Who: The Fan Show for the BBC, and we’ve got her! We talk with Christel about her journey from fan to pro, and then we take one last look at Series 10. Chip, Alyssa, and Rachel are together in-person to discuss one of the most intense episodes to date! Can they handle the feels, or will they need to enter the conversion theater…? She last wrote for Doctor Who with 1989’s “Survival.” Now Rona Munro returns to Doctor Who with “The Eaters of Light”; was it to our taste? Plus we talk to Lisa Bowerman, who starred in Munro’s previous outing, and indulge in a little Chris Chibnall Kremlinology. Chip couldn’t tell who had the higher-pitched voice: the returning-after-decades hexapod Alpha Centauri, or Alyssa after she realized that it was indeed an Alpha cameo! We found plenty more to talk about, though, in Mark Gatiss’s possible swan song from Doctor Who: why we frequently look at Doctor Who through political lenses, whether or not Nardole is a tin dog, and how much we appreciate our fandom community. Recorded live and in person during DC Pride 2017! Beware fake news! Chip and Alyssa peel back the propaganda and take a close look at “The Lie of the Land.” Plus: Alyssa reflects on Bill Potts at the beginning of Pride Month. A 5,000-year-old pyramid drops into existence in a single day as a harbinger of apocalypse. We talk about this part-two-of-three and whether it addresses the questions about “consent” it raises. Also in this feature-length podcast: We talk to Sarah Dollard, writer of this season’s “Thin Ice,” and Reality Bomb’s Shannon Dohar and Graeme Burk explore the Received Fan Wisdom about the Second Doctor! Extremis Veritas Expelliarmus! Particle physicists and priests alike are shocked into submission when they learn the truth of the world. Did Chip and Alyssa buy this departure from the “meat and potatoes” Doctor Who we had in the previous five episodes? Plus, Chip lies on the couch rather than behind the sofa as he and Alyssa talk about fandom disagreements and matters of taste in tight-knit fan communities. Feeling short of breath? Chip and Alyssa squee over Rose and Ten coming to Big Finish and review Jamie Mathieson’s “Oxygen.” Then, Chip is joined by our friends Kyle and Erik from Doctor Who: The Writers’ Room to talk about the scripts of Series 10! Which is scarier: gothic horror or moving house? Chip, Alyssa and Rachel dig into “Knock Knock” and check in on the first third of Series 10. Tom Attah and Joy Piedmont join Alyssa as they deep-dive under the “Thin Ice.” Chip quizzes NPR’s Glen Weldon on Doctor Who’s place in American nerd culture, then puts on his Two-minute Time Lord hat to ponder why, with so many great shows, books and characters out there, he keeps coming back to the TARDIS. Emojibots! Is Doctor Who riding a trend or is the trend already played out? Chip and Rachel review “Smile” and ponder how successful Doctor Who is at making topical references, from Beatles cameos to unfortunate dance moves. ALSO: Chip and Rachel discover the hard way that some news is not in fact news with the help of Radio Free Skaro’s Warren Frey. What more is there to say than, “New Doctor Who! Bill! Mysterious vaults! Nardole?” Well, how about “Special Guest Petra Mayer” from National Public Radio? Let’s dive into the series premiere, shall we? We’re getting more and more excited for Series 10 (Two Masters!) but we’re also looking back at two Twelfth Doctors. Chip prefers Series Eight’s; Alyssa prefers Series Nine’s. Who’s right? Also, meet pop culture bloggers and Whovians par excellence Kim Rogers and Sage Young of Head Over Feels! This Week in Time Travel launches a week late (thanks to Alyssa losing her voice) with a double-sized debut to make up for it! Chip and Alyssa welcome regular panelists Rachel Donner and Tom Attah to prognosticate and pontificate about the upcoming new series of Doctor Who. Alyssa interviews the titanic artist of the Titan Comics Twelfth Doctor, Rachael Stott. Chip speaks to Paul Cornell, who is leaving writing other peoples’ characters behind including his beloved Doctor, but also has a powerful, personal novel on the shelves now in Chalk. Chip Sudderth (@2minutetimelord) and Alyssa Franke (@WhovianFeminism) announce the latest addition to The Incomparable family of podcasts—a weekly dive into the worlds of Doctor Who!